NASL Season 3 playoffs, EVO gets record-breaking registrations, GSL kicks into high-gear, top-tier Shootmania was on display for the first time, Valve adds sponsor support in-game for Dota 2, and more. Welcome back to our weekly wrap-up of news and events from the world of competitive gaming. Every Wednesday we'll bring you the biggest news for the biggest events from leagues and tournaments from around the world. The North American StarLeague Season 3 playoffs for StarCraft 2 commenced last weekend as the final eight players have been confirmed for Toronto in just a few weeks. The Round of 16 featured three unbelievable comebacks from players--down 0-2--who were able to win three straight games to win their series. No player was on display more than Chris "HuK" Loranger from Evil Geniuses, the last North American player alive in the tournament. The end was looking near for Huk, promptly going down a quick two games to Complexity's Kim "GanZi" Dong Ju. With everything on the line, Huk showed why you can't count him out, winning three straight games with relatively the same 2/3 colossus and gateway unit timing attack, booking his ticket to represent his country on home soil. Among the players joining him at the finals will be two-time NASL champion and teammate Lee "PuMa" Ho Joon, French superstar Ilyes "Stephano" Satouri, and Boss Toss Jang "MC" Min Chul. This is the first major PC competitive gaming event in Canada in quite a while, dating back to IEM Edmonton in 2009, and WSVG Toronto in 2007. With the Montreal Barcraft scene celebrating Huk's MLG victory in Orlando of last year, it was vitally important for him qualify and be there. It's been a long time since WSVG, but based on what we've seen from Barcraft, and my experiences in the past, I expect Canada to step it up and show everyone they deserve to host these finals. Videos of the playoffs this weekend can be watched at right here at GameSpot. The best fighting game players from over 40 countries will descend upon Las Vegas next weekend to battle it out in record numbers at the EVO 2012 World Finals. Capcom, Warner Bros., and Sega are putting up a collective $100,000 in cash prizes while EVO organization is offering a $10,000 college scholarship for gamers. "We will have over 3,500 competitors (actual human beings), which is a record for us", organizer Tom Cannon told GameSpot. The entrants include Team MadCatz Daigo "The Beast" Umehara, and Evil Geniuses' Justin Wong. "I estimate another 4,000-6,000 spectators, but it's impossible to say accurately as it's free to attend except Sunday." This year's EVO Championships will have more support from developers and publishers than ever before as well, setting a record amount of prize money for the event. Capcom leads the way with $25,000 for Super Street Fighter IV, $15,000 for Ultimate Marvel vs Capcom 3, and $9,000 for Street Fighter X Tekken. Warner Brothers is supporting with $23,000 for Mortal Kombat 9, and Sega will be there with Virtua Fighter 5 Final Showdown and $15,000. "With Capcom celebrating its 25th Anniversary of Street Fighter this year, we thought it fitting that Evo's Super Street Fighter IV: Arcade Edition 2012 competitors should play for $25,000," Christian Svensson, Senior Vice President at Capcom told Shoryuken.com. Ubisoft Nadeo's upcoming eSports-focused game Shootmania had its first major top-tier display last weekend at the Cybsum event in Paris, France. Some of the world's best Quake players were there, including many of those who chose to come to this event instead of the Quake Live Finals at DreamHack Summer the week before. Players on-hand included Italian star Alessandro "Stermy" Avallone, DreamHack Winter runner-up Alexey "Cypher" Yanushevsky, old-school Swede Magnus 'fox' Olsson, and France's hometown hero Kevin 'Strenx' Baeza. They were joined by local French players and an American team comprised of all-star Counter-Strike players that won the qualifying tournament at E3 2012. As Shootmania is a deathmatch FPS game, the longtime Quake players led the way with over a decade of experience and skill. They were able to put on a show for the fans and the developers, demonstrating how deathmatch FPS games are still a beloved (if somewhat neglected) genre in recent times. The game is currently in the alpha stage, as a lack of guns and game modes has created a somewhat shallow experience thus far. Stermy led his team to victory over Fox's team in the finals, and you can watch how it all went down here. BoxeR on the shelf until Heart of the Swarm? Lim "BoxeR" Yo Hwan, one of the most famous players in eSports history, might not make his return to Starcraft II until the release of Heart of The Swarm. BoxeR has been sidelined with a shoulder injury since May 1, forcing him to forfeit his GSL games and drop out of competition temporarily. In a new interview conducted by gamechosun.co.kr's Siwoo Lee, SlayerS founder and captain BoxeR discusses his current state, and when we might see The Terran Emperor return to action. "This is the longest break that I've had since my debut as a Starcraft player, it's been nice", said BoxeR, who has been competing professionally since 2000. "I might return at Heart of Swarm's release, or possibly sooner than that." BoxeR picture taken by Siwoo Lee, courtesy GameChosun.co.kr. The longtime Terran player may not be as satisfied with the game itself, which has been seen by some as helping out Protoss and Zerg more than the race that he's used throughout his entire Starcraft and Starcraft II career. The changes could move BoxeR into a position he's never been in before: a different race. While BoxeR rests, his longtime colleague and friend Lee "NaDa" Yoon Yeol announced his retirement, as after more a decade of playing, he must fulfill his military obligations. 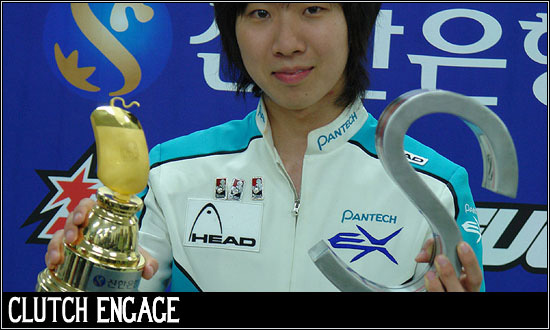 NaDa is one of, if not the most consistent Starcraft player of all time, performing well in both Brood War and Starcraft II, and is one of only four players in history to win the Golden Mouse, a feat BoxeR still attempts to do. As of just last night, defending GSL champion Jung "MVP" Jong Hyun has been eliminated from this season's Code S championship, losing to teammate Ahn "Seed" Sang Won and TeamLiquid's Yoon "TaeJa" Young Suh. MVP won his fourth GSL title last season, more than any other player in the league, but he will have to wait at least until next season to win his fifth. Three more groups remain, including the Group of Death tonight featuring Lee "MarineKing" Jung Hoon, MC, Kang "Symbol" Dong Hyun, and Park "Squirtle" Hyun Woo, while the last remaining foreigner Johan "NaNiwa" Luchessi tries for his second consecutive round-of-eight appearance. Valve has released a competitive update for Dota 2, filling a stated "need to connect tournament organizers and professional players to their fans." The first aspect is the tournament viewing client, which allows players to watch games within Dota 2 itself, and not through a streaming site such as Twitch.TV or own3d.TV. Not only do players have full camera controls in-game, but tournament organizers can set-up a PPV system where Valve and the organizer will share revenue made through the event. There is also more support for teams in-game, where players can identify themselves as a competitive Dota 2 team, and have their sponsors and skins show up inside of the game. In-game advertising is something that sponsors in competitive gaming have been wanting for a long time, but haven't been able to find a good way to do it. Valve may just have figured that out. North America's best Counter-Strike 1.6, Source, and Team Fortress 2 players will converge on Dallas, Texas this weekend for the ESEA Season 11 LAN Finals. The event can be watched all weekend long through ESEA's Twitch account, with casters Jimmy "Whisenhunt" Whisenhunt, Corey "dunN" Dunn, Ron "Rambo" Kim and Connor "CAKEbuilder" Gentilcore recapping all the action. [CORRECTION]: This article originally neglected to acknowledge IEM Edmonton in 2009 as a major Canadian competition and misreported Stermy's opponent in the Shootmania finals as Cypher. GameSpot regrets the errors.